Canadian Prime Minister Justin Trudeau completed yesterday a three-day state visit to Washington, which included talks with President Barack Obama and Secretary of State John Kerry, as well as a state dinner at the White House. Behind the celebrity-style glitz and fawning media coverage, Trudeau and Obama focused on deepening their countries’ long-standing strategic collaboration. Although the main areas of discussion publicly reported concerned trade, other economic issues and climate change, Ottawa and Washington’s military-security cooperation was central to the Canada-US summit. At a joint White House press conference Thursday morning, Obama and Trudeau made several policy announcements. Canadian and US intelligence agencies will increase information sharing, with the purported aim of speeding up exit and entry at the border and ensuring the accuracy of no-fly lists. This expands on the already extensive integration of Canada’s intelligence agencies with those of the US, including through the US National Security Agency-led “five eyes” alliance which conducts mass surveillance on the world’s telecommunications and internet use. The two leaders also committed to increased cooperation in the Arctic on scientific work and in developing new commercial shipping routes, and to a joint plan to reduce methane gas emissions at oil and gas facilities. Both went out of their way to underscore the strengthening of Canadian-US ties, with Obama declaring, “We have a common outlook on the world, and I have to say I have never seen so many Americans excited about the visit of a Canadian prime minister.” Obama held out the hope that an agreement on the softwood lumber trade dispute will be reached before the expiry next October of the one-year grace period that kicked in when the previous nine-year deal ended last fall. Trudeau announced he will host a “three amigos” NAFTA summit, with Obama and Mexican President Enrique Peña Nieto this June, following which Obama will address a joint session of Canada’s two houses of Parliament. Trudeau also indicated his support for Washington’s rapprochement with Cuba—a country with which Canada has extensive economic and diplomatic relations—and discussed working with Washington to bring an end to the decades-long insurgency in the jungles of Colombia. Like the US, Canada has close ties to Colombia’s right-wing government, which behind a thin democratic facade ruthlessly represses social opposition. “Canada and the U.S. will stand side by side to confront the pressing needs that face not only our two countries, but the entire planet,” Trudeau told the press. At the state dinner held in the White House later Thursday, Obama and Trudeau both lauded the Canada-US military-security partnership, which goes back to the outbreak of World War II. “[W]e agree that our countries are stronger and the world is safer when we work together,” declared Trudeau. Trudeau won the support of significant sections of Canada’s ruling elite during last year’s election campaign, due in no small part to the Liberals’ commitment to strengthen Canada’s strategic partnership with Washington. This takes place under conditions where US imperialism is the most destabilizing force in world politics, having been waging virtually uninterrupted war for the past quarter-century as it seeks to use its overwhelming military superiority to offset its economic decline. Trudeau’s predecessor, Conservative Prime Minister Stephen Harper, embraced US-led military interventions in Libya in 2011, and Syria and Iraq in 2014, while expanding the Afghanistan deployment launched by the Chretien Liberal government. But sections of big business grew concerned that his government was mismanaging relations with the US by openly aligning with Obama’s Republican opponents over the Keystone XL pipeline and encouraging Israeli Prime Minister Netanyahu in bucking Washington’s counsel. On Thursday, the two leaders pledged to work towards implementing the Trans-Pacific Partnership (TTP) trade deal, the economic arm of Washington’s geostrategic offensive against Beijing. The extent of Canadian-US military collaboration was revealed in a CBC report last fall on how in 2013 talks took place at the highest levels of the countries’ militaries about creating a joint expeditionary force capable of offensive deployments around the world. Former Canadian Chief of the Defence Staff General Tom Lawson and the then-head of the US Joints Chief of Staff US General Martin Dempsey considered ways to improve interoperability between the two armed forces, and even floated the idea of fully merging the Canadian and US militaries. Predictably, the bourgeois press avoided raising such issues during Trudeau’s US visit. Instead, it reported breathlessly on the “warmth” of the relationship between the president and prime minister, their jokes and quips, the menu for Thursday evening’s state dinner and the lavish gowns worn by their wives. The media’s incessant, mind-numbing propaganda serves a definite political purpose: to conceal from the population the real, aggressive character of the discussions that are taking place. Colin Robertson, a former Canadian diplomat who is now a fellow with the Canadian Global Affairs Institute, produced a briefing paper earlier this week that sheds light on the real agenda for Canada-US military-security collaboration being worked out in elite circles. Robertson urged Canada to intensify security and military cooperation with the US in the Arctic so as to challenge Russia’s growing presence in the far north. To this end, he called on the Canadian government to join the US ballistic missile defence system (BMD)—a highly destabilizing weapons system whose ultimate purpose is to make the fighting and winning of a nuclear war possible. 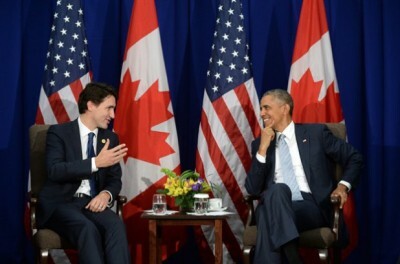 It is in this context that Obama and Trudeau agreed to step up collaboration in the Arctic, building on the 2012 Tri-Command Framework for Arctic Cooperation agreement, the aim of which is to further integrate the US Northern Command, Canadian Joint Operations Command and the North American Aerospace Defence Command (NORAD). In parallel with the 2012 agreement, a statement of intent was signed on joint military training and exercises in the Arctic region. Lastly, Robertson demanded that Canada boost its military spending to 2 percent of GDP in line with the commitment made by the NATO alliance in 2014. This would equate to a doubling of the current Canadian Defence Department budget to some $40 billion per year. A major reason for the Canadian ruling elite’s enthusiasm for an even closer military partnership with US imperialism is its concern over the relative decline of Canada’s economic importance to its southern neighbour. At present, 76 percent of Canadian exports go to the United States, while Canada accounts for 19 percent of all US exports. But growth in Canada-US trade has been slowing for more than a decade and last November Canada was overtaken by China as the US’s largest trading partner. Mexico, whose trade volume with the United States has grown rapidly since the turn of the century, in large measure due to low-wage auto production, is also rapidly closing in on Canada. Obama’s decision to cancel the Keystone XL pipeline project last year was a major blow to the Canadian bourgeoisie, particularly that section based around the oil and gas industry in Alberta and Saskatchewan. It has intensified the crisis facing western Canadian oil producers, which currently lack any means to transport their product to tidal water, meaning that much of it is sold at substantially below world market prices to US customers. Several influential think tanks are calling on the Canadian government to press for a “continental energy and climate change strategy” with the dual aim of using the growing energy independence of North America to give the US and Canada greater geo-political leverage and developing green energy technology to give North American capitalism a competitive advantage. The McDonald-Laurier Institute wrote in a paper on Canada-US relations, published to coincide with Trudeau’s visit, that energy independence is “worthwhile for both Canada and the US in the face of the geopolitical calculations behind production decisions in other energy-producing jurisdictions.” It went on to urge Trudeau to advocate strongly not only for the resurrection of the Keystone project, but an expansion of binational energy and electricity infrastructure.